This Connemara marble key ring features a carved Celtic cross. This Celtic cross key ring is made of genuine Connemara marble; it measures 1 1/2" wide.and includes a metal chain and ring. 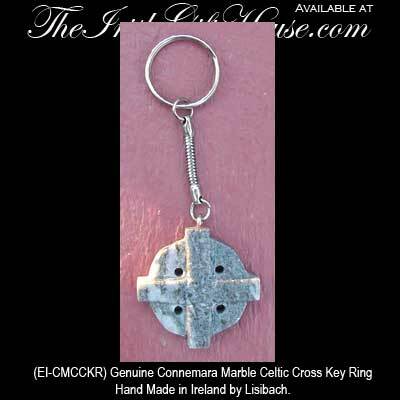 The Irish key ring is hand made in Ireland by Lisibach and gift boxed with Connemara marble and Celtic cross history cards that are compliments of The Irish Gift House.